Pope John Paul II created the diocese of Kalyan on 30 April 1988 by the decree ?Pro Christifidelibus?. Thus the establishment of the diocese and the appointment of the first Bishop came into effect from April 30, 1988. The new eparchy has its territory co-extensive with the territories of 5 Latin dioceses such as the Archdiocese of Bombay, the diocese of Vasai, Poona, Nashik and Sindhudurg. The Episcopal Ordination of Mar Paul Chittilapilly and the official inauguration of the eparchy took place on August 24, 1988 at the Don Bosco Grounds, Matunga, Bombay. In order to make sure of the Christians presence and service in all 15 districts of the Eparchy, 10 of them were entrusted to MST, VC, MCBS and CMI religious congregations. On May 1st, 1990 Sangli, Kolhapur, Sindhudurg, Ratnagiri districts were given to M.S.T. Congregation. On 11th September 1991, Ahmednagar district was given to Vincentian congregation. On 4th October 1992, Satara and Solapur districts were given to M.C.B.S Congregation. On 2nd February 1993, Jalgaon, Dhule and Nandurbar districts were given to C.M.I. priests. 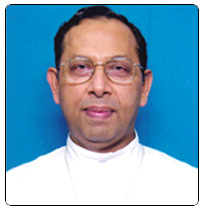 After nine years of dedicated pioneering work in the newly born diocese, Bishop Paul Chittilapilly was transferred to the diocese of Thamarassery in Kerala on December 18, 1996 and took charge on February 13, 1997. Mar Thomas Elavanal MCBS, the second bishop of Kalyan was consecrated on February 8, 1997 at Vikhroli, Mumbai.